Ken Loach films don't really need to come with a warning anymore. The director is known for the ways in which he tackles political and social subject matter, more often than not criticising something that's either hidden deep within his films or made plain and clear on the surface. I, Daniel Blake evokes a similar kind of feeling from the title alone. No one really begins a sentence with "I, [name]" unless making a pretty big statement, and that is exactly what Loach is doing here. As per most of his films, he is making a statement. Politics, of course, can always feature in cinema. Some would argue, even, that it should always feature in cinema. But when a film is so focused on being politically invigorating, it's more than easy to lose sense of actually making a good film in its own right. For the most part, Loach walks this balance pretty steadily. I, Daniel Blake is rarely anything particularly memorable (besides a few moments which we'll come to later), but it remains a thoughtful and justifiably angry piece of cinema that subdues itself in order to sustain a watchable mood. The final fifteen minutes, however, lose this. 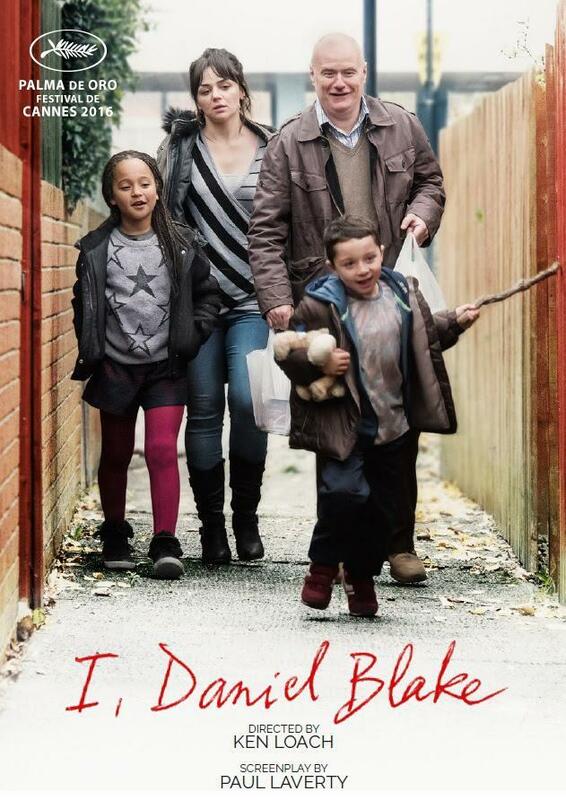 In its home stretch, I, Daniel Blake becomes unbalanced, melodrama begins to seep in and it loses hold on the impressive grasp it has over the ideas and points its making. But we don't need to go into that yet. I, Daniel Blake smartly begins after Daniel (Dave Johns) has suffered a heart attack, which allows the film to feel like it's started before we arrive. It's just one of many elements that keeps the film feeling so completely realistic. From then on, we watch as he's told by his doctor that he shouldn't return to work yet for health reasons, but then informed by his local benefit office that he doesn't tick enough boxes to be classed "unfit for work", forcing him onto Jobseekers Allowance in order to get by. During this process, he meets Katie (Hayley Squires) and her two young children, who have recently moved to the area after being homeless and are denied benefit money after simply being late to an appointment. Daniel, Katie and her children try to navigate through the situation together, as best they can. The most profound element of I, Daniel Blake perhaps isn't the way it tries to open the audiences' eyes to the real world, but the way the film itself so vividly presents it. The cinematography is, as bizarre as it is to say, almost non-existent. Every shot feels natural, every colour feels quietened, even the soundtrack is barely noticeable (in fact, I'm genuinely struggling to remember if it has one one). There's nothing flashy or exciting about the way the film looks or sounds, and it works wonders in fleshing out an environment vital to the film's success. Also in-keeping with the film's realistic approach to this story is its actors and performances. Stand-up comedian Dave Johns makes the most of his feature film debut with a quietly strong performance - he is incredibly controlled in the way he restrains emotion. It's pretty rare that Daniel loses his temper in the film, and Johns' way of portraying how he feels even without expressing it physically is deeply impressive. When you remember that it's his feature film debut, it becomes a truly special performance. The spotlight shines more brightly, though, on Hayley Squires, who effortlessly portrays every emotion or feeling you can name, ranging from gratitude to suffering to adoration to helplessness. Sometimes she even manages them all at once. Her performance is a clear high point of the film, and carries it through some of its slower and more tedious patches. Casting two unknown actors in the leading roles is just another way to allow the film to feel that little bit more real. There's nothing worse than being engrossed in a harrowing story about the real world and having well known faces constantly popping up every other scene. Loach has targeted realism here, and achieved it masterfully. While the film as a whole doesn't hit as hard as it probably should, there are a number of sequences across the film that find monumental power in the smallest of moments. As Katie is up all night trying her best to make their new house clean and tidy for her kids, she accidentally wakes up her daughter who simply makes her mother promise her that she will go to bed at some point. A week or so later, Katie's daughter climbs into bed with her, freezing cold, and admits that other children have been bullying her for the simple reason that her shoes fell apart at school. There's no loud violin music, no dramatic camera flourishes, just powerful performances bound to moments that feel very small but also very moving, The film's most devastating moment, though, comes as Daniel accompanies Katie and her children to the local food back. It's a tough enough scene to watch in the first place, but one act of sheer desperation on Katie's behalf will break your heart. Most of it plays out in a single take, but it's the way Squires portrays the utter helplessness of Katie's situation that hits the hardest. All she wants is to make decent lives for her children, and when they too come running over to see why she's upset it's enough to bring a tear to the eye. It's safe to say that I, Daniel Blake works best when it binds emotion to simple character moments, which is why it's frustrating that the film widens its spectrum so vastly in its final act. Katie resorts to prostitution to help bring money into her home, but the sequence leading up to it plays more like a stereotypical way to evoke sympathy - it rarely feels personal to her. Daniel's graffiti on the benefit office's wall begins with promise, but then can't decide whether it should be funny and empowering or sad and shocking, leaving the film's titular sequence feeling seriously muddled. There's an understandable but also frustrating lack of closure to Katie's side of the story, too. The final few minutes aim for something big, but fall short because the film hasn't done enough to allow such a big moment to stick the landing. For the most part, I, Daniel Blake is a deeply moving look at a difficult part of life, but when Loach widens his gazes and really tries to hammer his points in, he loses what made them so powerful to begin with. When we watch a film, we want to feel for these characters in this story in this world. Cinema is about escapism, and, sure, it's allowed to bleed into the real world whenever it likes, but it can only achieve this if the film's contents enable it. As soon as it loses touch with what it is offering in terms of fiction, it cannot connect to the real, very non-fictional world. Here, Loach has set up a powerful story and mostly succeeded, it's just a shame he forgets about his characters when he goes for his boldest moments. To Summarise: Its overly political nature may do as much harm as it does good, but I, Daniel Blake is a predominantly thought-provoking film that boasts a deeply moving performance from Hayley Squires.